Our Raw Milk is sold only at our Farm Shop. Come on up for a visit or share driving with other customers near you. Because cows are meant to eat grass, cows raised on pasture are healthier than those confined inside a barn, eating a diet high in grain and other concentrated feeds. Milk and meat from grass-fed cows have much higher levels of good Omega-3 fatty acids, and lower levels of unhealthy Omega-6's . They are an excellent source of conjugated linoleic acid (CLA), a necessary amino acid that is nearly absent in conventionally raised dairy products. 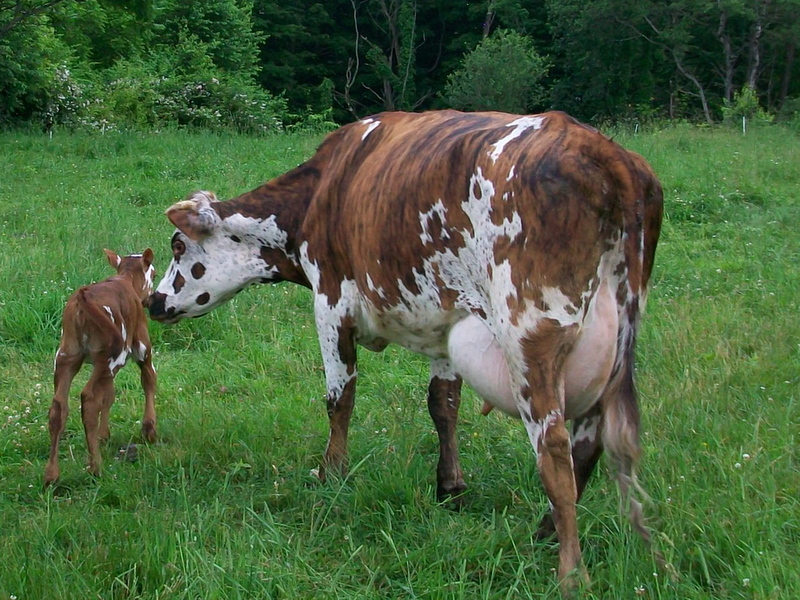 Levels of beta carotene and vitamins A and D are also higher in milk from grass-fed cows. Plus, it tastes better! Federal regulations require that we pasteurize the milk we use to make our yogurt. But we believe that people who want to buy clean, unpasteurized, unhomogenized milk should be able to safely do so. We offer our state-inspected raw milk for sale in our farm shop in Hawley. 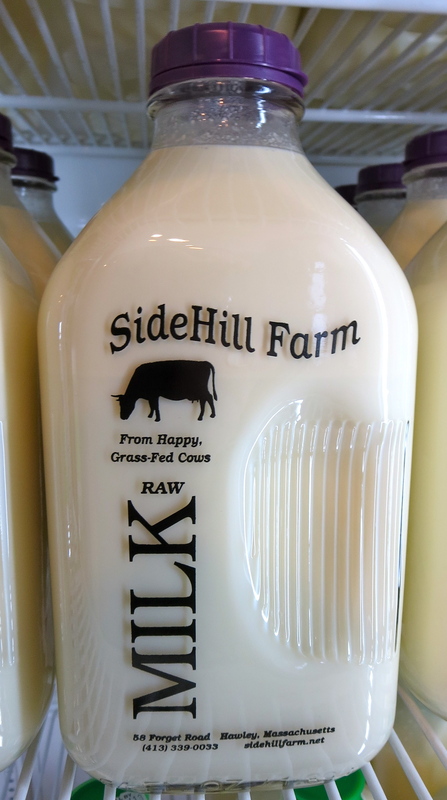 In Massachusetts, raw milk can only be sold from the farm, so to enjoy it, you need to come to us here in Hawley! Raw milk is not pasteurized. Pasteurization involves heating the milk to destroy any harmful bacteria that might be present – a process mandated to overcome dirty conditions in some dairies. However, it also destroys all the beneficial organisms, and a whole array of enzymes, amino acids, and vitamins that are essential to human nutrition. You might have noticed that processed milk is Vitamin D fortified. This is because the vitamin is destroyed by pasteurization, and must be replaced from other sources. Massachusetts state standards for raw milk are much, much stricter than for milk for pasteurization, so the milk from a licensed raw milk dairy is extremely clean. Our milk is regularly tested, and our equipment inspected by a state milk inspector. Raw milk is also not homogenized, so the cream rises to the top. Homogenization breaks the fat globules into tiny droplets so the cream will not separate. Recent research indicates that homogenization may contribute significantly to cardiovascular diseases because these tiny fat droplets can pass into the bloodstream without first being fully digested, allowing them to adhere to artery walls. Many people think that the health benefits of raw milk approach that of a medicine. We have heard stories from our customers of undersized babies suddenly starting to grow after drinking raw milk, and lactose intolerant individuals drinking raw milk with no ill effects. We can’t substantiate those claims, but what we do know is that it tastes great. Scoop off the cream for your coffee, or just shake the jug to mix in the cream, and enjoy the rich, full flavor of what milk is supposed to taste like! The key to keeping raw milk fresh is to keep it cold. Please bring a cooler (or at least a towel to wrap it in) when you come to pick it up, and please don‘t leave the jug out on the table during meals! The milk will keep at least a week past the sell-by date. Many customers have found that the milk keeps longer in glass bottles; presumably glass is less permeable to oxygen than the plastic. When raw milk does start to turn, instead of spoiling into nasty rancidness, it sours. Sour cream, cultured buttermilk, and yogurt are all milk soured with specific bacterial cultures. Clean milk from healthy cows contains many beneficial bacteria. These natural bacteria in the milk are slowly multiplying, and while they haven't been selected for flavor (like yogurt, etc), once the milk sours it is still excellent for baking and pancakes.